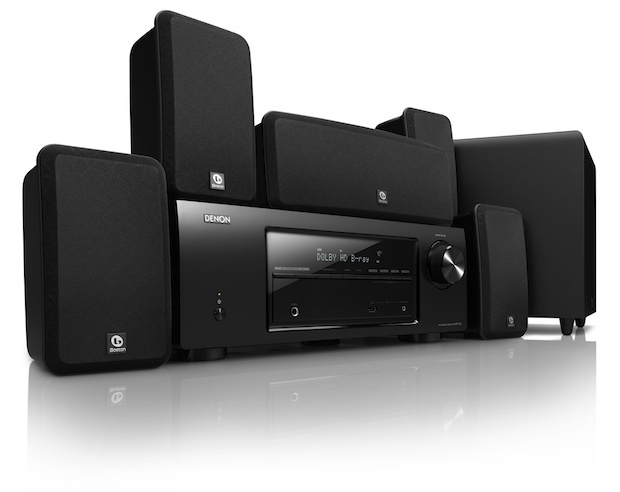 UPGRADE TO AMAZING SURROUND SOUND â€“ RIGHT OUT OF THE BOX! Mahwah, NJ, April 25, 2012Â –Â Denon Electronics, a premier manufacturer of high-quality audio and home entertainment products, is proud to announce the availability of itsÂ DHT-1513BA Home Theater SystemÂ (SRP: $599.99), a powerful yet compact turnkey solution that combines an advanced Denon A/V receiver and amplifier with six acoustically matched Boston Acoustics loudspeakers for a room-filling surround sound experience. Designed for total simplicity of set-up and use, the DHT-1513BA dramatically enhances the enjoyment of movies, music and games right out of the box. Denonâ€™s DHT-1513BA system features a slimmer, vibration-resistant chassis design twenty percent smaller than previous Denon home theater systems, making it ideal for easy installation in virtually any room. DHT-1513BA offers simple and intuitive ways to incorporate more personal audio/video content from smartphones, digital cameras, via easily accessible front-panel HDMI input. The DHT-1513BAâ€™s built-in receiver is outfitted with several audio technologies to ensure an immersive surround sound experience. With equal power amp design, each of the receiver’s five channels is powered by its own discrete circuitry. This allows the receiver to reproduce original sounds more faithfully than those which use integrated circuits. Additionally, thanks to its four HDMI inputs, the system lets users route multiple high-definition devices, including set-top boxes, game consoles and Blu-ray players, directly to their TV. Users can also connect all of their devices to the display with a single HDMI cable effectively reducing cable clutter. Finally, thanks to its ability to pass through 3D signals from a Blu-ray player, users can enjoy true â€œfuture-readiness,â€ with the assurance that they will be able to enjoy the maximum benefits of todayâ€™s emerging 3D video technologies. For more information on Denon, visitÂ http://usa.denon.com. Become a fan of Denon on Facebook atÂ http://www.facebook.com/denonusaÂ or follow Denon on Twitter athttp://twitter.com/denonus. D&M Holdings Inc. is a global operating company providing worldwide management and distribution platforms for premium consumer, automotive, commercial and professional audio and video businesses including DenonÂ®, MarantzÂ®, McIntoshÂ® Laboratory, Boston AcousticsÂ®, Snell Acoustics, Escient?, Calrec Audio, Denon DJ, Allen & Heath, D&M Professional and D&M Premium Sound Solutions. Our technologies improve the quality of any audio and visual experience. All product and brand names with a trademark symbol are trademarks or registered trademarks of D&M Holdings, Inc. or its subsidiaries. For more information visitÂ www.dm-holdings.com.